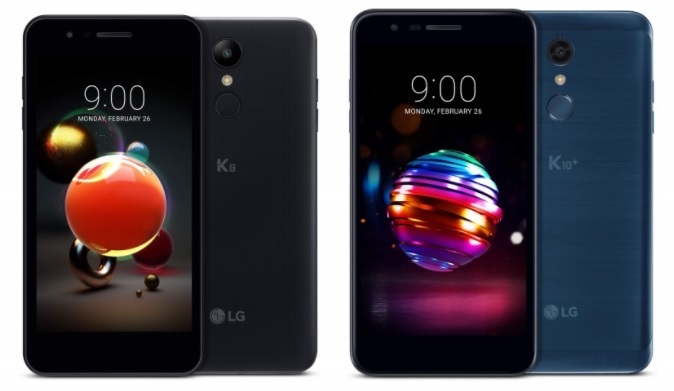 LG has announced the 2018 models of the K8 and K10 smartphone series, which includes the K8 2018, K10, K10a, and K10+ 2018. The K10 line flaunts a 5.3-inch HD screen with 1280 x 720 resolution, translating to 277 pixels per inch. Inside, it is powered by 1.5GHz octa-core processor. On the other hand, the K10+ variant packs 3GB of RAM and 32GB of internal storage, while both K10 and K10a come with smaller 2GB of RAM and 16GB of internal storage. In terms of camera, both K10+ and K10 sport 13-megapixel rear camera and 8-megapixel or 5-megapixel wide front shooter, while the K10a is geared with 8-megapixel main snapper and 5-megapixel front camera. The K10 line is geared with 3000mAh battery. Jumping to the K8, it boasts 5.0-inch HD panel with 1280 x 720 resolution, giving 294 pixels per inch. Inside, it features 1.3GHz quad-core processor complemented with 2GB of RAM and 16GB of internal storage. It is packed with 8-megapixel rear camera, 5-megapixel front shooter, and 2500mAh battery. MWC visitors can experience the new K8 and K10 at LG's booth in Hall 3 of Fira Gran Via beginning February 26 to March 1.